Moxy Hotels, Marriott International’s experiential hotel brand, has opened its newest hotel, at Scotland’s busiest airport in Edinburgh. The 230-bedroom Moxy Edinburgh Airport brings a playful twist on the traditional airport hotel offering. 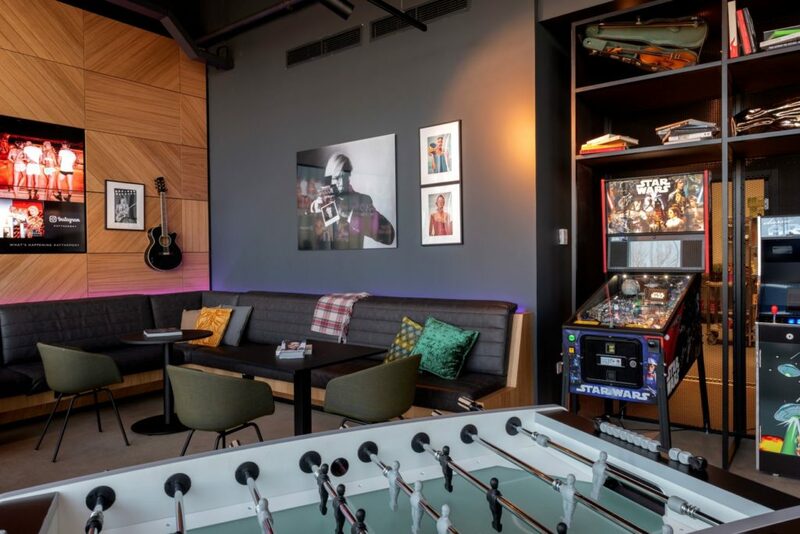 The edgy, millennial-focused boutique hotel brand, which is designed for today’s savvy hyper-connected, techy global traveller, ensures that a great atmosphere and fun vibe is at the forefront of the hotel’s personality. Hot on the heels of opening a Moxy in Glasgow’s Merchant Quarter in late 2018, the management group Belvar brings its experience of the brand to operate this hotel. CEO Mads Jacobsen commented, “Since launching into the UK market back in December 2016, we continue to strengthen our footprint and are delighted to be adding the energy of the Moxy brand to Edinburgh Airport with this new property. Moxy, with design-led innovation in its DNA, is famed for reflecting each hotel’s locality in its décor. Known for displaying original art, Moxy Edinburgh commissioned several pieces from Amsterdam-based street artists. There are large scale graffiti style portraits of Scots Shirley Manson and Sean Connery, with incorporated text about their careers, by the entrance. To reflect its locality, the hotel has a book-themed interior as a nod to Edinburgh’s status as UNESCO’s City of Literature. 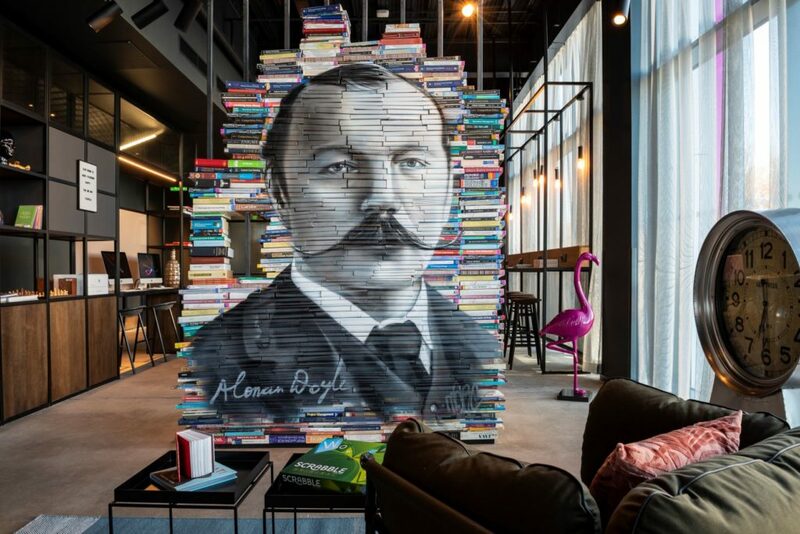 As an example, a portrait of Sir Arthur Conan Doyle, he of Sherlock Holmes fame, is painted directly onto a large stack of books – including one called Enigma – in the lobby. The millennial-focused lifestyle brand has appeal to leisure and business travellers alike. Aside from its 230 bedrooms the hotel has two Meet Up rooms, aimed at tech-savvy travellers, a 24 hour gym, a coffee bar, self-service food & beverage outlets and a bar for cocktails, wines and craft beers. Currently operating 14 Moxy hotels, Belvar opened its first Moxy in Aberdeen in 2016 and has opened 3 London hotels in the last 18 months. Excel and Stratford opened in 2017 and Heathrow opened in April 2018. There are already 29 worldwide Moxy hotels and Belvar has 6 further planned openings this year within Europe including York, Southampton, Paris and Verona.